At the heart of the vineyards and halfway between Strasbourg and Colmar, an old 18th century wine-making house completely renovated. In this charming half-timbered building, formerly the house of the winegrower, you will stay in a vast duplex equipped for 4 people and benefit from your privative terrace. It has 2 bedrooms, a large living room, a fully equipped kitchen, a bathroom, 2 toilets and a reading area, the apartment also has a private terrace with garden furniture and Deck chair in the courtyard nicely landscaped. Secure private parking. Our host is the most! My wife and I just retired. We arrived at this rental property for a one week stay and wish we could have stayed longer. This is our 7th property on a four month European trip. So far, this has been our favorite property. The property is an historic structure that has been completely renovated while retaining it's historical charm. It was clean, modern, tastefully decorated and comfortable. Perfect parking. Everything in the property was new including plates, glassware, cookware, appliances, etc. The local bakery was within 100 meters. We can't speak any foreign language. So, it was very important when my wife can down with a medical issue and the owners helped us navigate to obtain medical attention. We are forever grateful. They both went out of their way to personally take her to the local doctor and checked in on my wife several times during our stay. I wish the owners had created a book to show their renovation project from start to finish because the property, which includes a beautiful courtyard, is very artistically and tastefully completed. This was a great location to visit the Alsace region for daily trips. L'appartement est conforme à la description et a été rénové avec goût. Il est parfaitement équipé, très propre, la literie est bonne et la salle de bains spacieuse et très agréable. La maison est bien située dans le centre d'Epfig et l'endroit est calme. Claude est un hôte parfait, très serviable et aux petits soins. Wir wurden sehr nett von der Vermieterin Veronique empfangen. Die Wohnung ist wunderschön, ist neu renoviert, sehr schön eingerichtet und man hat alles, was man braucht. Auf dem Platz im Hof kann man wunderbar sitzen und entspannen, morgens frühstücken und abends beieinander sitzen. Der Ort Epfig hat uns gut gefallen. Er ist nicht so "hübsch" wie manch andere Orte im Elsass, dadurch aber nicht touristisch "überlaufen". Dennoch wird einem als Tourist einiges geboten (Sonntagabends z.B. wird auf dem Marktplatz gemeinsam mit allen die mögen gegrillt). Wir kommen gerne wieder. Wir haben uns in der geräumigen Wohnung sehr wohl gefühlt; sie ist geschmackvoll und hochwertig eingerichtet. Die Betten sind bequem, die Küche ist wunderbar ausgestattet und das Badezimmer ist einfach perfekt! In der näheren Umgebung findet man viele Möglichkeiten zu wandern, einzukaufen und essen zu gehen. Vielen Dank, wir kommen sehr gerne wieder! So macht das Elsass Spaß. Ein wirklich schönes Haus, mit viel Liebe und Geschmack von den netten Eigentümern saniert, so dass man sich richtig wohl fühlt und die Seele baumeln lassen kann. Wir kommen bestimmt mal wieder. Vielen Dank für Ihre nette Bewertung.ich hoffe Sie für einen nächten Aufenthalt empfangen zu dürfen! Alsace is a tourist region with a strong cultural and architectural identity. It is also a region with a rich gastronomic heritage. The village, located in the vineyards of Alsace and on the Roman road, is a village offering all services (bakery, grocery, post office, pharmacy, doctor, hairdresser, beauty care ...). 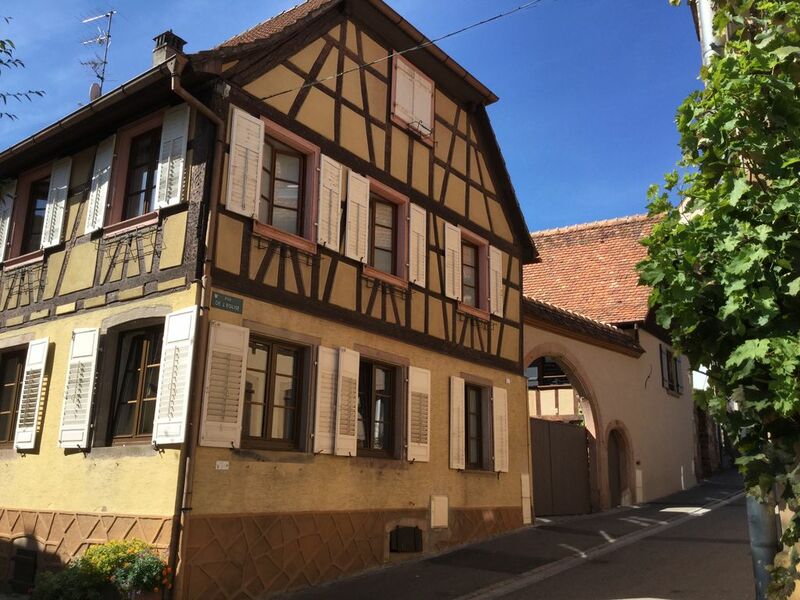 Located halfway between Strasbourg and Colmar, EPFIG is an ideal location to visit the region with many of the most beautiful villages in France.